Alluring Spring Palate — "Sea Bass Menu"
With spring fever wide spread, Novotel Ambassador Gangnam makes a special suggestion to take your palate back with ‘Sea bass Menu’ at its Japanese Super Dining Restaurant ‘SHUNMI’. Sea bass is best in taste in March and abundant in vitamin C to help recover from fatigue. The high-protein & low-fat fish is also good for diet while speeding up recovery from operation. SHUNMI, acknowledged by ZAGAT which is the world’s best restaurant guidebook, offers modern Japanese cuisines and this spring it presents special seasonal menu of Sea bass from March 15 through May 28. 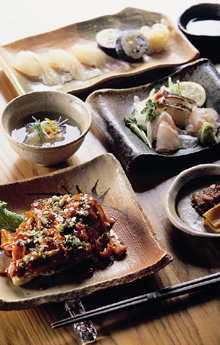 The Sea bass menu, 150,000 won, features Sea bass Sashimi, Boiled Dish, Sea bass Deep Fried Dish, Sea bass Steamed Dish, Ochazuke Rice, Pickles and dessert. Also, Sea bass steak menu is available at 65,000won for non-sashimi guests. The tasteful and nutritious Sea bass is a must-dish in Japan on any celebration occasions. High in taurine, inosine and glutamine, Sea bass is the best choice to fill up the energy for spring. The trendiest Japanese restaurant in Seoul, SHUNMI goes under partial renovation from March 8 to 12 to provide Sake private dining room and Sushi bar.